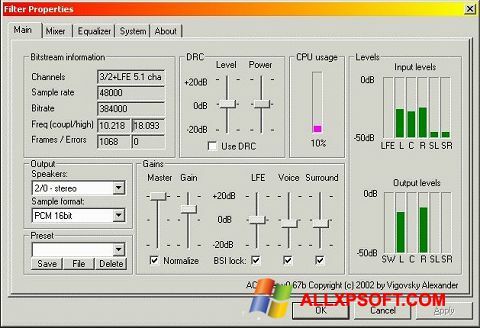 AC3 Codec for Windows XP - software necessary for correct reproduction of audio and video documents. The codec is responsible for the stable launch of files of a certain format in many popular media players. Without it, you can not watch movies or listen to digital recordings. The program is easily installed on a personal computer and passively works with the media players present in the system. You can free download AC3 Codec official latest version for Windows XP in English.